Shadows on shadows, a body slowly makes its way onto a dark stage. Is it male or female? Does it matter? In the cramped confines off the mainstage of Subiaco Arts Centre, the audience is confronted with questions, most of which remain unanswered. Opening this triple bill by Ochre Contemporary Dance Company, Chrissie Parrott’s latest work is, in many ways, the antithesis of her more famous choreographies. Beyond is unadorned minimalism – a single performer (the extraordinary Floeur Alder); no props; none of the detailed staging that characterises many of Parrott’s works. Here, we’re presented with the human form – as canvas and tool – and the end result is as compelling as it is opaque. For more than a decade Parrott has been creating works that make effective use of multimedia technologies. With each successive work, her skills in this brave new world are finessed. For Beyond, Alder’s body is used as a screen onto which animations are projected. Colourfully obscure, it’s never entirely clear what the images are or what they signify but visually, the effect is stunning. In other phrases, Alder whips through the air, a frenzy of muscular movement. A frenzy of muscular movement: Floeur Alder in ‘Beyond’. Photo: Maree Laffan. Alder’s years of training are evident in her control of her vessel – her limbs a perfect embodiment of the taut rhythms of the music providing the sonic backdrop to the work. Music is always upfront in a Parrott production (although interestingly here, her musician partner Jonathan Mustard is responsible only for animation) and Beyond is no exception. The soundscape is dense, driving, a cloud of sound that at times reminded me of This Mortal Coil, though it turned out to be something more obscure. As a visual spectacle, Beyond exceeds expectations – just don’t ask me what it was about. Following this was a sensory feast of another kind – this time on film. 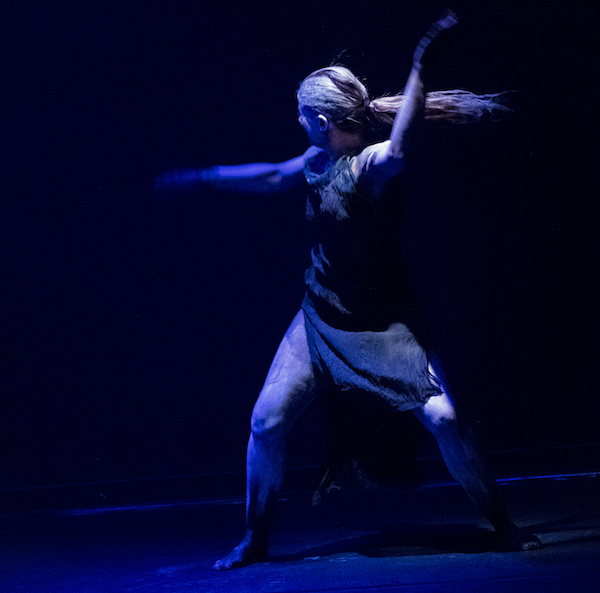 Kwongkan (Sand) is directed by Ochre Contemporary Dance Company’s artistic director, Mark Howett. The film opens with four dancers emerging from calm, palm-fringed waters; their bodies conducting the rivulets dripping from their bodies…is it Arnhem Land, far North Queensland? Wrong – Trivandrum, India. Shifting from sea to land, from water to earth to fire, Kwongkan is a meditation on the natural elements. 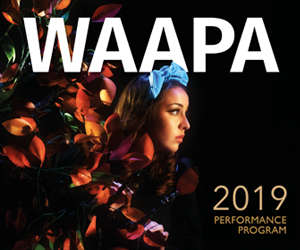 The team created the film while working on a dance work to be included in next year’s Perth Festival…a sequel of sorts to the wonderful Kaya, performed in 2016 by Ochre Contemporary Dance Company. Evocative, sensual, sumptuous…assuming this film is a sort of teaser for the full work, we’re in for a treat next year. The main event of the evening was Michael Leslie’s 3.3, also directed by Howett. Tackling Indigenous incarceration – one of the most significant moral questions of contemporary Australia – is no small feat, but somehow Leslie and co. manage to present a work that is as fearless as it is necessary. From the opening moments, we are slammed with reality. Ian Wilkes is exceptional as a man, an artist, incarcerated. I’m not sure how he’s going to last the season – he is unflinchingly physical for almost every minute he’s onstage. Whether crushing his body against the bars of his cell, scaling the walls or smashing his face into the Perspex window, Wilkes’ onslaught sweats with tension, bristles with fury. But then, just as you’re overwhelmed, there’s a sudden tonal shift – a gorgeous wash of classical music replaces the industrial soundscape and Wilkes is dancing, released within. The ferocity returns, another wave of injustice served and Wilkes is back to slamming his body against his constraints. Leslie comes to visit the prisoner. The two engage in a sparring match that pits pragmatism against emotion. Wilkes is enraged – at his situation, at the persecution of his people, at the rank violence of his nation’s history. Leslie acknowledges the injustices with a kind of acceptance that is deeply sad but also grimly realistic. He wants Wilkes to move forward, to seek his own victories in odds so steeply stacked against him. Leslie’s not excusing the system or the history – one gets the sense he’s just over it. On one level, it’s deeply depressing to witness; on another, strangely hopeful. Wilkes agrees to rehearse the steps for a dance – they go through the routine together, one man outside instructing, the other still in his cell. It’s uplifting and fierce and devastating all at once. 3.3 is based on Leslie’s Master’s thesis – a work investigating black history, neo-colonialism and incarceration. Transforming it into dance that is this transfixing is nothing less than extraordinary, cementing Leslie’s place as one of Australia’s foremost dance artists. “3.3 and Beyond” plays Subiaco Arts Centre until 3 June. Read Seesaw’s interview with Michael Leslie and Mark Howett. Pictured top: Unflinchingly physical: Ian Wilkes in ‘3.3’. Photo: Martine Perret.